Soap from Soap! DIY | Soaking in God's blessings, one journey at a time. Today I made soap, out of soap. Did you know that if you take a bar of soap, melt it into some water, add some glycerin, and let it cool, you’ll get soap? Neat, huh? I was originally inspired by Savvy Housekeeping a few months ago (http://www.savvyhousekeeping.com/how-to-turn-a-bar-of-soap-into-liquid-hand-soap/), but never got around to it. Just recently my sister and her roommate made some (http://merrydays.wordpress.com/2012/01/16/making-soap-from-soap-diy/) inspired by The Farmer’s Nest (http://www.thefarmersnest.com/2011/11/liquid-hand-soap-diy.html), and my desire to make my own was renewed. This afternoon I scoured CVS for Glycerin, with the help of an employee. We didn’t have any luck until I called my sister and she directed me to it, even though she’s in Minnesota and I’m in Virginia! I proudly showed the employee who had given up by that point, then went on my way. I bought Neutrogena Naturals Face and Body bar (http://www.neutrogena.com/product/neutrogena-+naturals+face+-+body+bar.do?sortby=ourPicks), because my sensitive skins prefers no dyes and added chemicals, etc. Because I will need a place to keep all of this soap, I bought a gallon of water, and plan on funneling the soap into the gallon. Clever, right? That’s all you need! 7-8 oz of bar soap, 1 gallon of water, and 2 tablespoons of Glycerin. 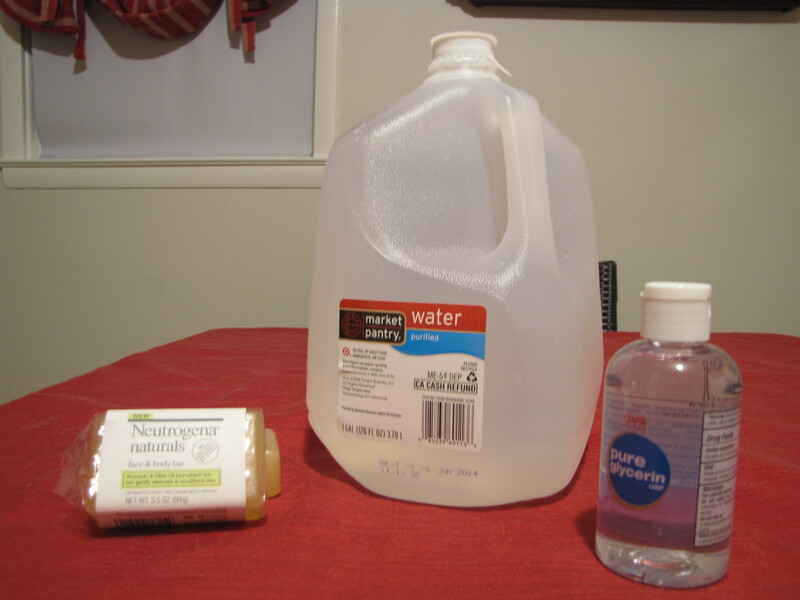 Soap, 1 gallon of Water, and Glycerin - that's ALL. 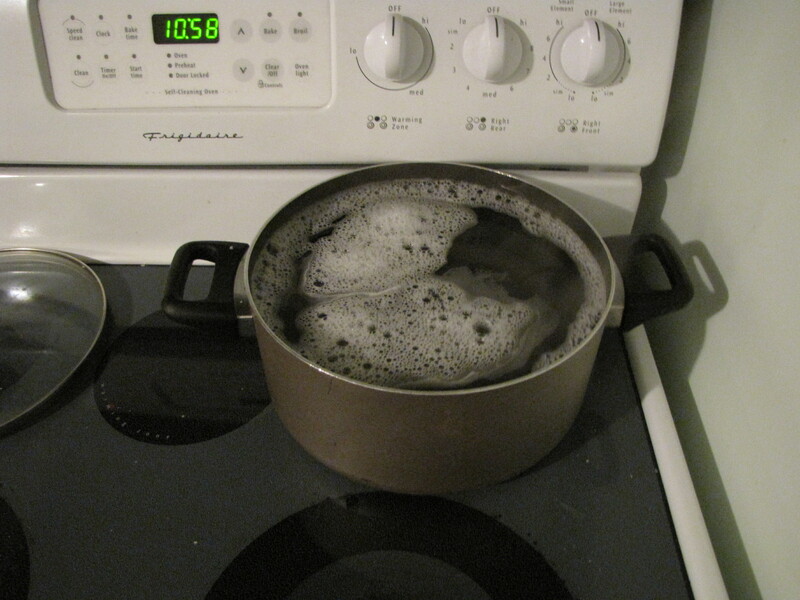 1)Pour the gallon of water into a large pot, and put on the stove on medium heat. 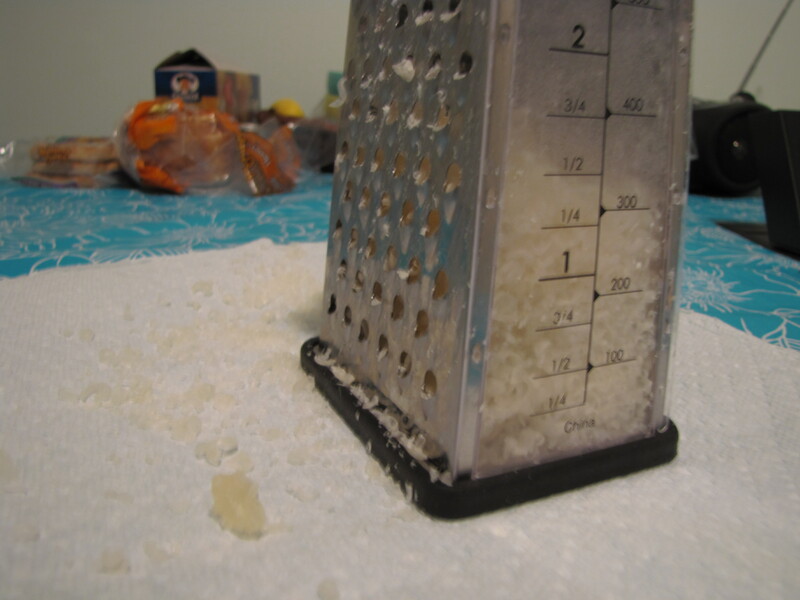 The other tutorials save this step for once the soap is grated, but I did this as my first step, because I anticipated grating for a while, and wanted to be time efficient. 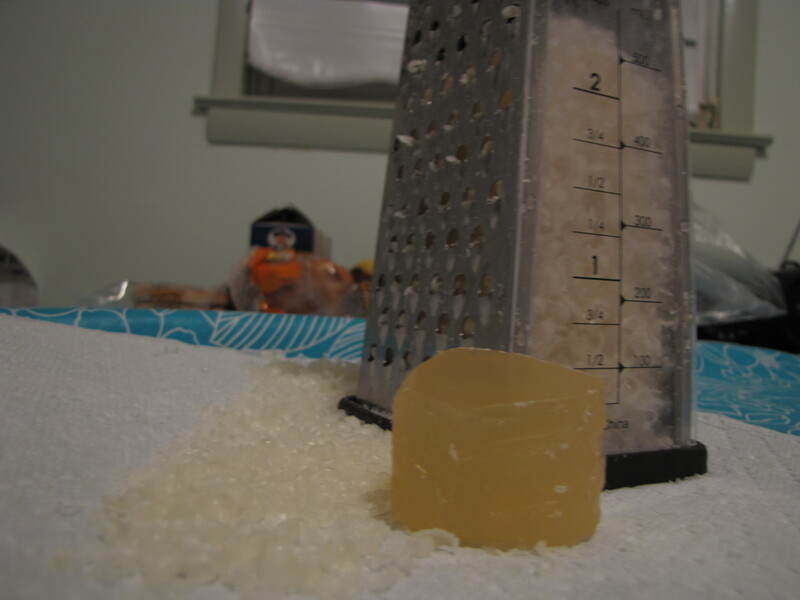 2)Grate the soap. 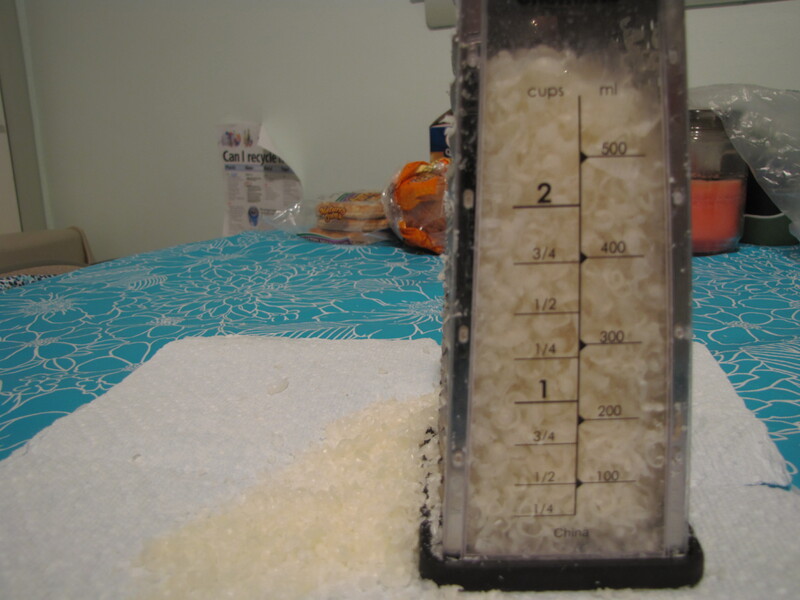 Be prepared to be shaky afterwards, if grating alone. Get a grating partner if possible. My left hand served as my partner, although it wasn’t as coordinated and quick as my right hand. One bar grated, down to a nub. Part way through the second bar - taking a photo as an excuse to rest. 3)Add the soap to the water. The soap in the process of dissolving. 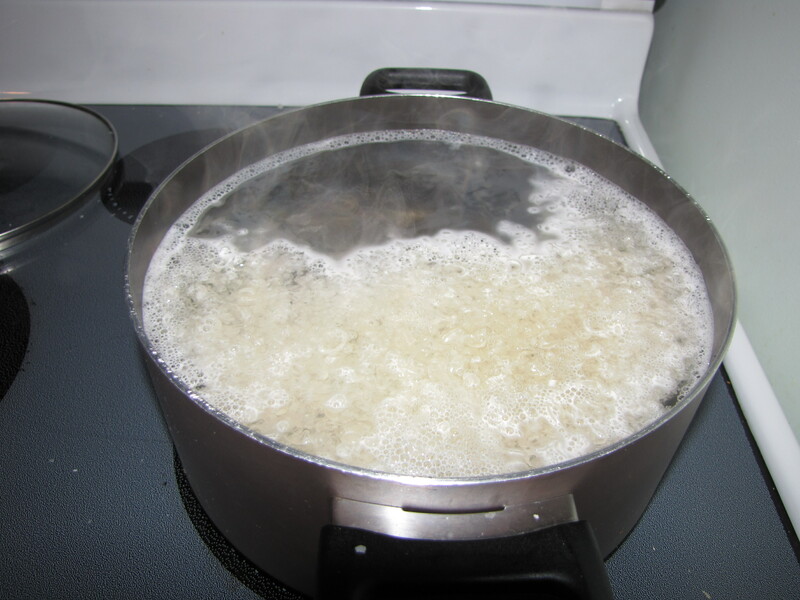 5)Stir until the soap is dissolved. It should look like soapy water. 6)Take off the heat and let rest for 12 hours. The soapy water moved to the back burner for an 12 hour rest. 7)See if you have soap! Note – I just did steps 1-6 this evening, and am now one hour into the resting. I’ve read it may be snot like consistency, or may need some whipping. We will see! If there are more steps, I’ll add those tomorrow, along with a picture of the finished product. I’m excited to use this soap! It’s saves a lot of money, and gives you the bragging rights of being resourceful. PS – Sorry the photos aren’t top quality! I AM a photographer, but didn’t have the energy to figure out how to properly capture things in the strange lighting of my kitchen. Plus my fingers were soapy, so I didn’t want to have much contact with my camera.